Below is an excerpt published and copyrighted by Frank Padilla of RESTORATION MOVEMENT FOR FAMILY AND LIFE MINISTRIES, INC. based in Mandaluyong City, Philippines. It is so well written, that it's well worth sharing! 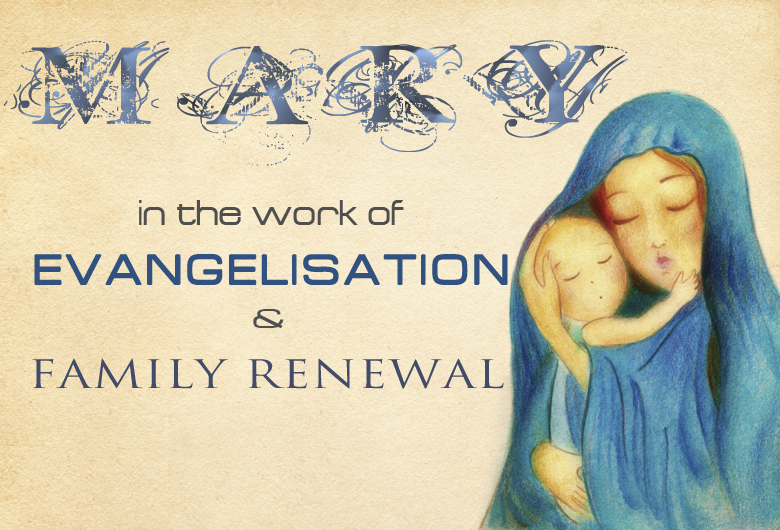 This is the penultimate post about Mary in the work of Evangelisation & Family Renewal. In the work of salvation (through the process of evangelisation), and in the life of the family, we see the one person, aside from our Lord Jesus Christ, who is so important according to the plan of God. That person is Mary. 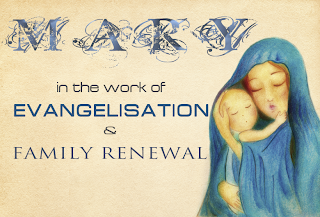 If we are to evangelise effectively, if we are to build strong Christian families, we need Mary. She is the mother of the Saviour, the handmaid of the Lord, the spouse of the Holy Spirit. She is the Queen of heaven and earth. She is the Star of [the New] Evangelisation. She is our intercessor and our mediatrix. She is the mother of the Church. She is co-Redemptrix with Jesus. She is our Mama Mary. ... And so our final response is devotion to Mary. We should be devoted to Mary because of who she is and her importance in God's plan of salvation. She is our beloved mother who wants to bring all her children home with her in heaven. She is the disciple par excellence, and so is a shining model for us to emulate in our own call to discipleship. She can truly inspire us. She is full of wisdom. She always points us to Jesus. She can intercede in a powerful way for us. How do we manifest our devotion to her? We do so by imitating her godly virtues. First, like Mary, we must always trust in God and not be afraid. Mary was greatly troubled when the angel Gabriel spoke to her. But Gabriel told her, "Do not be afraid, Mary, for you have found favour with God." (Lk 1:30). Mary wondered how she could conceive when she had had no relations with a man. Racing through her mind would also have been the thought that according to the law of Moses, the penalty for those guilty of adultery (Mary and Joseph were betrothed, but she had not yet gone to live with him in his home. For the Israelites, marriage consisted of this two-step process) was death by stoning. Then, when Jesus was presented at the temple, Simeon told her that a sword would pierce her heart (Lk2:35). Mary had every reason to be afraid, but she was not. She simply trusted in God's word. We too must trust and not be afraid. Though there are many people and circumstances we could be afraid of in the world, we put our hope in the Lord, because he is our Saviour. "God indeed is my saviour; I am confident and unafraid." (Is 12:2). The antidote to fear is not courage but rather trust. "Though an army encamp against me, my heart does not fear; though war be waged against me, even then do I trust." (Ps 27:3). We always have God to turn to. 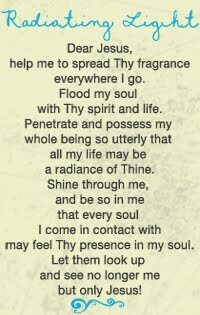 "Have no anxiety at all, but in everything, by prayer and petition, with thanksgiving, make your requests known to God. Then the peace of God that surpasses all understanding will guard your hearts and minds in Christ Jesus." (Phil 4:6-7). The fear that is in the hearts of many in the world in fact points to the necessity of evangelisation. People need to know Christ and the power of his resurrection. They need to know that they have a Saviour, in whom they can trust. They need to realise that God loves them so much as to offer His very own Son for their sins. "What then shall we say to this? If God is for us, who can be against us? He did not spare his own Son but handed him over for us all, how will he not also give us everything else along with him?" (Rom 8:31-32). Who then can separate us from the love of God? Nothing at all (Rom 8:35, 38-39). We simply trust in God. Second, like Mary, we must be obedient to God. With full faith and trust in God, Mary responded to the angel, "Behold, I am the handmaid of the Lord. May it be done to me according to your word." (Lk 1:38). Mary presented herself as a servant. She recognised her lowliness (Lk 1:48). She recognised that God would do great things for her, but that to Him alone was the glory. (Lk 1:49). We too are servants of Christ. Nay, we are slaves of Christ, for he has purchased us at the price of his precious blood (1 Cor 6:20). We belong to him. What servant does not obey the master? But it is not just a question of a master-servant relationship. Rather it is about a relationship of love. Jesus says, "If you love me, you will keep my commandments." (Jn 14:15). In fact, in his last supper discourse, Jesus connects obedience to love a number of times (Jn 14:21, 23, 24; 15:10, 14, 17). If we love God, we must obey Him. One of the greatest areas of obedience is responding to the Great Commission. Jesus has given us a charge. We are to proclaim the gospel to the whole world. We are to work in season or out of season. We are not to count the cost. We are to hold nothing back. We are to give our all, even life itself. By this, "you are glorifying God for your obedient confession of the gospel of Christ" (2 Cor 9:13). At the wedding in Cana, where Jesus performed his first miracle, Mary told the servers, "Do whatever he tells you." (Jn 2:5). Mary tells us the same thing. We simply need to obey. Third, like Mary, we must be willing to suffer. Mary suffered much. While pregnant, she traveled some distance to Bethlehem to be enrolled in the census. She gave birth in a filthy manger. She had to flee to Egypt with her newborn infant. She lost Jesus in Jerusalem. She saw her Son considered crazy by their own relatives, betrayed by Judas, abandoned by his disciples, denied by Peter, rejected by the people, tortured by the Romans, and finally crucified as a criminal. She had been forewarned by Simeon when she and Joseph presented Jesus in the temple. He said, "you yourself a sword will pierce" (Lk 2:35). We too will suffer pain and affliction in the world. This is a consequence of our own sin, or the effect on us of the sin of others, or simply due to the assaults of the evil one. Suffering is very much part and parcel of living in the world, which is a valley of tears. Especially when we oppose the works of the enemy, he will attack us. He is able to cause physical and emotional pain. But suffering is intended by God to be redemptive. It disciplines us, it purifies us, it shows us our own human weakness and helplessness, it leads us to total dependence on God, it humbles us. Thus, while not having to look for suffering in life, when it comes, and it certainly will come one way or another, we embrace it. We look to the good it will cause, to happen in our life. We know that God can make straight crooked lines. In the same way, he can bring good out of bad. He can make suffering an instrument of our redemption. And of course, to suffer, especially for the sake of righteousness, is to participate in the cross of Christ. It is the means of moving forward as a disciple, as we take up our cross. It is the greatest of privileges, as God allows us to be afflicted just as He allowed His Son to be afflicted. Fourth, like Mary, we must maintain our joy. Mary exulted, "my spirit rejoices in God my Saviour." (Lk 1:47). Despite all her suffering, she chose to look at all the blessings she received from God. She was privileged to bring the Saviour of the world, into the world. She was the mother of God. She was treated in a very unique way by God, chosen from among all the women of the world. Indeed, again she exulted, "The Almighty One has done great things for me" (Lk 1:49). Mary rejoiced at Jesus' birth, at his presentation in the temple, at the generous words of Simeon and Anna, at the thirty years of family life they had in Nazareth, at his first miracle in Cana, at his healing and blessing many people, at his resurrection, and the outpouring of the Spirit on Pentecost, at the birth of the Church. Hers was not an easy life, but it was a life filled with joy. We too, like Elizabeth and John in her womb when Mary visited, rejoice in the coming of Jesus into our lives and into our homes. We rejoice in the time of his visitation. We rejoice in the salvation brought by the Saviour. We rejoice in the many miracles, big and small, that we experience in our day-to-day lives. We rejoice in the privilege of proclaiming Christ to the world. "Rejoice in the Lord always. I shall say it again: rejoice!" (Phil 4:4).